The Snow House is located 100 steps from the harbor beach, 6 blocks from the center of town and only one house away from Commercial Street at the start of the Gallery District. Our beautiful, historic captain's home boasts water views, a roof deck, oversized bedrooms, stainless steel kitchen, a large yard with a Viking stainless steel gas grill, two zoned central A/C, and parking for four cars (2 tandem spots). The designer chef’s kitchen features a Viking six burner gas range, Sub-Zero refrigerator/freezer, Miele oven and Bosch dishwasher. Cooking is made even more enjoyable by virtue of the open floor plan which connects the kitchen to the dining area with seating for eight. The oversized living room with wood burning fireplace is just steps away. The house has stereo speakers throughout, free wireless Internet and two high definition flat screen televisions with high definition cable. My family had a beach house growing up, so I always dreamed of owning one especially in Ptown. Even though the Snow House was built in 1847, Steve and I are only the 3rd owners. We are incredibly lucky to have this grand, historic home as part of our family. Very close to all Ptown has to offer, but still incredibly peaceful. The original charm of the house with its wide pine floors and cast iron radiators is still intact and enhanced with all the modern conveniences; central A/C, stainless kitchen, WiFi, etc. With three king size beds plus one room with a queen bed, this is a great house for a group of adults. The kitchen and dining area is very usable and nice for group dinners. The property is charming with a nice yard. The location is great, East side but close to so much. The only thing to be aware of is that the stairs up to three bedrooms and the stairs down to the laundry area are steep (as with many old houses), so keep that in mind if mobility is an issue for you. But we have nothing but good things to say about this fantastic property and the owners, who were very easy to work with. Thanks so much for a great stay! The Snowhouse a Grand Find! The Snowhouse is just as advertised: clean, spacious, well-maintained, comfortable and perfectly located in Town. The owner could not have been more accommodating and a pleasure to work with. It was a treat to have parked the car and walked everywhere for a week! Restaurants, clubs, shops...all within an easy walk of this delightful place to stay. Highly recommended! Kevin, thank you very much for your kind words! I am so glad you enjoyed your stay and happy you will be returning again next year. My wife, daughter and a friend just checked out of this beautiful home. We were in Provincetown for a wedding and were looking for that rare combination of central location and peace. That is exactly what we found. The house is a stone's throw from the most interesting stretch of Commercial's restaurants and shops but, surrounded by hedges, flowering trees, ferns and white picket fence, could easily be mistaken for the countryside! The house itself is spacious, airy and decorated in an appealing, contemporary Cape style. The downstairs is open-plan, features a very convivial and useable "chef's kitchen" and opens on all directions to the garden. The bedrooms are charming with high ceilings and new baths. While we most often ate our meals in the garden, the roof terrace was perfect for sundowners and soaking up the view of Cape Cod Bay. The owners are obviously gardiners as the lush garden was packed with both easily and less easily identifiable specimens. Much was in bloom and the scent of summer was everywhere. The BBQ, outdoor table and local seafood markets synched perfectly for an al-fresco seafood feast. Before our arrival, we had a number of questions regarding markets, beaches, hikes and other activities. Michael was extremely helpful and obviously knowledgeable about the local secrets. While we have no wedding on the horizon, we have already rebooked for a family vacation next summer. Pat thank you so much for your glowing and thoughtful review. Thank you also for being such fantastic guests. We very much look forward to your return soon! The home is well-appointed, very large and clearly well-loved by the owners. My overall experience was excellent as the amount of space and room to share with friends and family was plentiful. The kitchen is a homerun completely refurbished and layed out perfectly. I loved the picket fence around the house which allows children a little bit more security for playtime whether in the front or in the back. The bathrooms we're better than some of the five star luxury hotels that I've stayed in. Plenty of room, awesome air conditioning, and great location! Thank you Michael. Thank you so much for taking the time to write such a glowing review. We love our home and are so glad it showed and that you enjoyed our home as much as we do. We look forward to your return soon! Perfect House in the Center of Ptown! The house was perfectly located in the center of town on a quiet street. With 4 bedrooms and 4 bathrooms, we were all very comfortable. The central air ensured we had a nice respite from the summer heat. The kitchen was well stocked with all of the cooking utensils and pots and pans we could need. 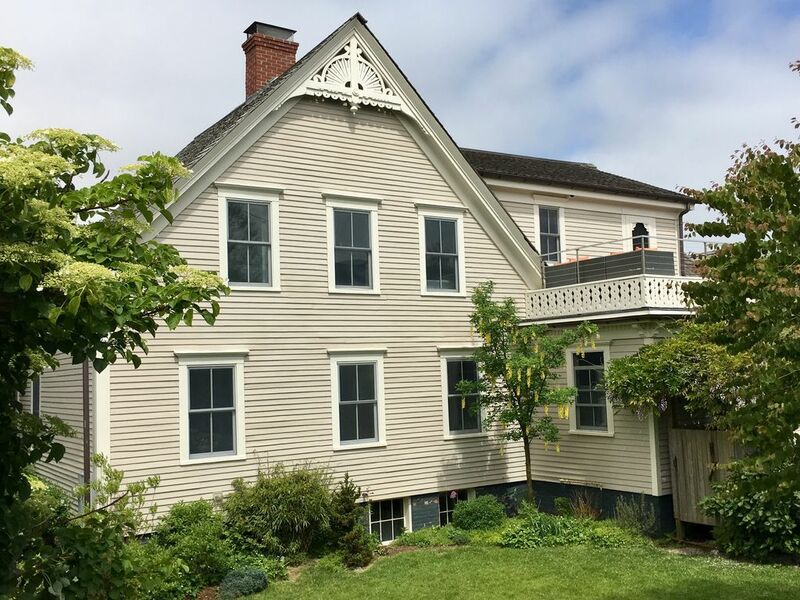 The roof deck and expansive yard made this house a gem of a find in Provincetown. The owner was exceptionally warm and welcoming and ensured we had all we needed. We cannot wait to book this house again next year!!! We are thrilled you enjoyed our home as much as we do. It was a pleasure having you as guests and we very much look forward to your return next year! We had several couples staying together in the house and it couldn't have been more perfect. Breakfast out in the backyard, drinks on the roof deck, less than a block from Commercial Street. It was really a dream. Absolutely wonderful experience and would recommend it to everyone! Thank you so much for your kind words. We are thrilled you had such a great stay and hope you return soon!